I’m so sad to report a play which I felt was one of the best of the year, if not THEE best, Paula Vogel’s beautiful lesbian musical play “Indecent” is closing on Sunday June 24. It did win two Tonys, but it didn’t win the crucial Best Play of the Year Award. Winner of two 2017 Tony Awards, INDECENT will play its final performance on Broadway on Sunday, June 25th at 3:00 PM at the Cort Theatre (138 West 48th Street, between Sixth and Seventh Avenues.) At the time of closing, INDECENT will have played 79 performances and 15 previews. One of the most talked-about plays in the 2016-17 season following its debut last year at the Vineyard Theatre in NYC, INDECENT opened on Broadway April 18 and began previews on April 4. INDECENT marked the Broadway debuts of many of the artists involved in its creation, including playwright Paula Vogel, director Rebecca Taichman, choreographer David Dorfman and members of the cast and performing ensemble. The production received Tony Awards for Rebecca Taichman, Best Director of a Play; and Christopher Akerlind, Best Lighting Design of a Play; along with the Outer Critics Circle Award and Obie Award for Outstanding Director of a Play (Rebecca Taichman) and the Lortel Award for Outstanding Choreography (David Dorfman). Paula Vogel was honored with a Special Citation as playwright and mentor from the New York Drama Critics Circle, and received a Lifetime Achievement Award from the Obie Awards. 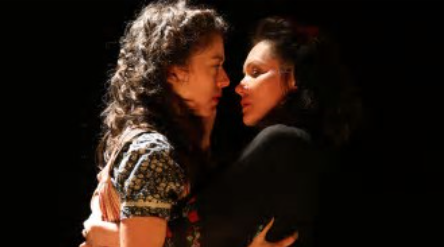 INDECENT has also been selected as Best Play by the Off-Broadway Alliance. A new play by Pulitzer Prize-winner Paula Vogel (How I Learned to Drive), created by Ms. Vogel and Rebecca Taichman, and directed by Ms. Taichman, INDECENT is about the love and passion to create theatre, even in the most difficult of circumstances. The play follows a troupe of actors, the cast of Sholem Asch’s God of Vengeance, who risked their lives and careers against enormous challenges to perform a work in which they deeply believed, at a time when art, freedom and truth were on trial. It is a story told with compassion, honesty, but also with great theatricality, and joyous songs and dances. The ensemble of INDECENT features Matt Darriau, Lisa Gutkin, Aaron Halva, Katrina Lenk, Mimi Lieber, Max Gordon Moore, Tom Nelis, Steven Rattazzi, Richard Topol and Adina Verson. The cast has – not unlike the theater troupe depicted in the play itself – been performing the play together for more than two years: during its development with the Sundance Theater Institute and Oregon Shakespeare Festival, followed by productions at Yale Rep, La Jolla Playhouse and the Vineyard Theatre, where INDECENT had its New York debut last summer. The production also features Zoë Aqua, Ben Cherry, Andrea Goss, Eleanor Reissa, Uri Sharlin and Doug Wieselman. INDECENT features music composed by Lisa Gutkin and Aaron Halva, who play onstage along with cast members throughout the show. The production is choreographed by David Dorfman. Scenic design is by Riccardo Hernandez; costume design is by Emily Rebholz; lighting design is by Christopher Akerlind; sound design is by Matt Hubbs and projection design is by Tal Yarden.